THE “McDONALDIZATION” OF OUR SPIRITUAL LIVES. I have marked in bold blue the meaningful parts to me. A biographical history of the Church reveals that over the centuries, joyful and wildly free-spirited men and women with hearts aflame did great and often unpredictable exploits for God. No one could have calculated how God would use such people as John Hess, Joan of Arc, Jim Elliott, Billy Graham, etc. In fact, the actions of the men of faith in Hebrews 11 were often incalculable: Abraham, “by faith…when called…obeyed and went, even though he did not know where he was going.” Others “…through faith conquered kingdom… shut the mouths of lions, quenched the fury of the flames, and escaped the edge of the sword; whose weakness was turned to strength; and who became powerful in battle and routed foreign armies.” (Heb. 11:33, 34 - Selected) God, I believe is looking for men and women with hearts burning with His love, who dare to challenge the status quo by attempting great things for God that often upset and even turn on end the stagnant, predictable norms in the Christian ghetto. If you and I make it a practice to wait upon Him, and truly listen to his voice, our lives will become increasingly impossible to calculate. God will guide us into paths of service we can not imagine: “I will lead the blind by ways they have not known, along unfamiliar paths I will guide them...” (Isa. 42:16a) Yet, everything in us seems to fight for predictability and the utter absence of risk. Yet, God is continually stretching our faith, and challenging us to step out to do the incalculable; the unpredictable. Just today I received a phone call from George and Jeanne, business people in their 50’s who feel compelled by God to leave their easy upper-middle class life style for a couple of years, and go to Rwanda in the Name of Christ. It is their desire to try and help solve some of the horrific problems in that traumatized Country. QUESTION: Have you relegated your spiritual life to the calculable “McDonaldization” process? You know, spiritual auto pilot? Or are you inviting the fresh wind of the Spirit of God into your life to paint a unique portrait of Christ in and through you? Are you available to do the incalculable for God? Are you willing to be surprised by God, should he call you to do the incalculable? Perhaps he has a work for you to do that in your wildest imagination you could not have conceived? In a word, are you available to Him on His terms, rather than yours? In a sense, Dwight Hill has been somewhat of a business mentor to me. Roughly seven years I discovered his weekly postings (it wasn't called blogging back then) at Facts of the Matter. I've never meet the guy but I can say I've never read a post of his that was not full of great wisdom and application when it comes to pursuing Christ's reign in daily business activities. He just started a three part series called THE “McDONALDIZATION” OF OUR SPIRITUAL LIVES. The reality is that God’s working of His life into ours will not be accomplished in mini sound bites or by quick fix methodology. At best, the modern mind seems to demand a shortened process of shallow doses of time alone with God, to be caught on the run and sandwiched in between our work and our toys. The very idea that spiritual transformation is a slow, deliberate process is vexing to most moderns who move at warp speed in the concrete jungle of PDA’s, Wi Fi, the “Journal”, multi-tasking, and pressurized deadlines. QUESTION: In today’s inch deep and mile wide McDonaldized brand of efficient, “get it done now” Christianity, are you willing to break with this trivialized sub-culture and deliberately set aside sufficient, daily time to allow yourself to de-compress, and slow down – until the Spirit can penetrate, speak, convict, heal, transform, and lead? If not, you have already joined the McDonaldized “Christian” society of callow, trendy, will of the wisp, here today, gone tomorrow brand of insipid Christianity. And that, my friend is a modern day tragedy. I am looking forward to part two and three. I will post them when they come out over the next two weeks. Irish Calvinist addresses the why questions and provides help to Christians on what to say. "Surely the humanism that prevails our culture is not equipped to answer such grim displays of evil through the actions of people as Seung-Hui. The psychologist, likewise, may attack outside influences in trying to nail down precisely what was troubling him, however, the answer as to “why” remains elusive. Many post-modern university professors may have a hard time even deciding whether or not this was evil or not. Regardless of who is asked we seem to get a similar response, something was wrong with him. For most assuredly, something has to be wrong in order to make someone do such unspeakable things." "Additionally, it is a good time for the Christian to compassionately speak out against evil and to promote the God who alone has triumphed over it, will not turn a blind eye to it, and will one day completely eradicate the earth from it. We understand that history is moving in a linear direction, towards its pinnacle point, the return of the Lord Jesus Christ to rule and reign with all evil firmly suppressed under his sovereign foot. There is a day coming when he will reign in righteousness and all who do not submit to him will be crushed." "The Bible is overwhelmingly clear that God governs everything in the universe from the smallest bird to the largest storm. “Are not two sparrows sold for a penny?And not one of them will fall to the ground apart from your Father” (Matthew 10:29). “Even winds and sea obey him” (Matthew 8:27). “The lot is cast into the lap, but its every decision is from the Lord” (Proverbs 16:33). “The king’s heart is a stream of water in the hand of the Lord; he turns it wherever he will” (Proverbs 21:1). “Who has spoken and it came to pass, unless the Lord has commanded it?” (Lamentations 3:37). “Does disaster come to a city, unless the Lord has done it?” (Amos 3:6). “He commands even the unclean spirits, and they obey him” (Mark 1:27). “I am God, and there is none like me . . . saying, ‘My counsel shall stand, and I will accomplish all my purpose’” (Isaiah 46:9-10). There is no person or being in the universe that can thwart the sovereign will of God. Satan is his most powerful enemy and does much evil in the world, but he must first get God’s permission, and none of his actions is outside God’s governance. He never breaks free from his leash (Luke 22:31; Job 2:6-7; 42:11)." UPDATE: I was thinking it was only a five game series but I was wrong. There is still a (very slim) chance the Wild can pull things out - but they MUST win tomorrow night or it really is all over. The MN Wild dropped their third straight game last night to the Ducks. 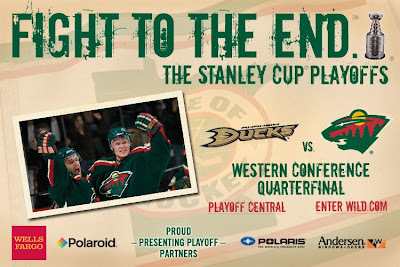 It's over, the Wild have been eliminated from the playoffs. I mentioned a month or so back I planned on skating two marathons this season (St. Paul and Big Granite.) I've changed now and will skate Hayward instead of Big Granite. There is just not enough time for me to get ready for Big Granite (June). Hayward has been reported to be a great race but it is the week before St. Paul. I am up for it. Yesterday I skated around my neighborhood just to get out and enjoy the great weather. I couldn't resist the urge to sprint a few times - I feel it in my hips and lower back this morning. Soon the sun will rise earlier and I'll be out on official training runs. I should wait for the street sweeper to get around too. Don't forget people the great gift Hockey has bestowed on all mankind. Be sure not to skip the out-links. I have a confession. My soul has been prompted by my wife revealing she almost burned our house down. Here I go. Confession time. Recently I took 220 volts through my pointer finger and thumb on my right hand. I've said it before. An very good, accurate, working definition of insanity is doing the same thing over and over again but expecting different results. Last Saturday an opportunity presented itself and I proved through experience (once again) the truth behind that definition of insanity. I was suppose to learn from this. I believe I have learned this time by comparing the similarities between the two events - appliances, 220 volts (still plugged in), and me. Our dryer blew a thermostat a few weeks back so I replaced it. This last Saturday Carla informed me the dryer was not working again - the new part failed. I decided to take five minutes and check it out. With mini-socket in hand I focused on removing the backplate. A good next step I thought was to check all the connections. The connection on the lower thermostat, slightly hidden from my view, apparently was exposed enough to shock whatever idiot wanted to touch it. Thankfully I am not six feet under and I tell you...it was far more than a shock! The burning sensation in my pointer finger and thumb is fading with each passing day. I am still waiting for my superpowers to kick in. Diets don't work. Supposedly a person is better off not dieting. Losing weight is not good for you. "Bleak as these figures seem, the true picture could be even worse, as it is thought that most people lie about their weight - and don't like to tell researchers that their weight has started to creep up again." Why don't diets work? People, people, people. People lie. People lose motivation. People give up. People worship food. Diets do work! A principle of effective dieting is eating less calories than you burn. This has always been true and will always be true. People lose weight because they eat less calories. All diets have this in common. All diets are not calories restrictive however. A diet can be about eating more calories to gain weight, perhaps lean muscle mass. Everyone is on a diet - to either lose weight or gain weight. The controlling factor is a person's inner motivations, the ruling desires of the heart. The key to healthy weight loss or weight gain is changing behavior and adapting new habits - changing the heart. It can be done. It happens everyday. Between that moment this morning of stopping my alarm from blaring and moving my feet from underneath the warmth of flannel sheets to the floor I think...back to life, back to reality. It is time to get up and get on with it. Life is calling me to engage and get things done. Yesterday I celebrated Christ's Resurrection with family and friends. Today, it is Monday and I have much to do. Back to life, back to reality. I got up (obviously.) It is 5:25 a.m. right now. Life really gets going for me in about 15 minutes when I put those 45 pounds plates on that flat bench-press bar over there and start my upper workout. Yesterday I thought of resurrection. This morning though, I began thinking too granular about life. I have already forgotten the magnitude of the meaning behind the resurrection of Christ. Thankfully though my friend Seth blogged last night I read his entry just now. He linked to a message from John Piper called "Radical Effects of the Resurrection". "This is a radical call for us to look hard at out present lives to see if they are shaped by the hope of the resurrection. Do we make decisions on the basis of gain in this world or gain in the next? Do we take risks for love’s sake that can only be explained as wise if there is a resurrection?" The whole simplified idea of this message is that the Resurrection of Christ impacts all of life...everyday. I know. I just needed to be reminded. But the impact is not what you'd expect. The resurrection is not about having a better life now, today. It is much greater than that and has more to do with suffering than my sinful heart prefers. But it is about true joy. How do I make this thinking reality in my life? How do I stop the insanity and make this message my everyday life? When? How? Here is the audio and here is the corresponding article. Like my friend Seth pleads...PLEASE LISTEN AND READ! "As we listen to eternity, we realize that the kingdom is about God radically changing people, but not in the self-absorbed sense our culture assumes. Christ came to break our allegiance to such an atrophied agenda and call us to the one goal worth living for. His kingdom is about the display of his glory and people who are holy. This is the change he came, lived, died, and rose to produce. This is the life and work he offers us in exchange for the temporary glories we would otherwise pursue. This kingdom agenda is intended to control our hearts and transform our lives." From Paul David Tripp, Instruments in the Redeemer's Hands, page 5. Change that matters is possible because the King has come. My mind has been focused on change lately. Because, I don't want to get to the end of my life and conclude that I wasted it. I want to look back and see tangible evidence that I invested everything I could into pursuing Christ's reign in all of life over all the earth for God's glory. I believe I've been veering off course. I need to change. I need to keep changing. The gospel demands it. Go back to the basics and review. God's providence has lead me to focus on a specific bible verse - Mark 1:15. I am amazed at the pinpoint precision of Jesus' first words as he began his public ministry. He said in Mark 1:15, "The time is fulfilled, and the kingdom of God is at hand; repent and believe in the gospel.". Jesus' announcement seems to be about the current state of the union - the kingdom of God. Jesus' words seem to give context to the meaning of life and human existence. He seems to be bringing the whole Old Testament to one single point in time and presenting the people a command. Now that He has arrived the command is "to repent, and believe in the gospel." The command from Mark 1:15 is to repent. I checked several dictionaries (English and Bible.) I also asked some family and friends to get their perspective. The general meaning of repentance is to turn away from sin and turn back to God. Fair enough. I would have said the same thing. But all these definitions along with the present age of psychological focus on feelings and behavior modification seem to greatly blur, if not dismiss, the original meaning of biblical repentance. I need to know the real meaning of this word, repent, in Mark 1:15. Bare with me, I need to look to the original Greek language. The transliterated word from the original Greek in Mark 1:15 is Metanoeo. It means to change one's mind. I have to admit in the past I tended to focus on feeling sorry for my sins. I focused on feeling differently. Often this caused me to wait on a feeling before I made changes, because if I didn't "feel it", then I wasn't really repenting. This is twisted thinking. Not biblical. Repentance begins with changing the mind. First, thinking differently. Focusing my thoughts on God and reexamining everything in my life. Feelings are irrelevant in the initial workings of repentance. Feelings flow out of thoughts. All this matters to to me because it involves action. I want to have an active faith. I want to actively engage with Jesus everyday in everything. I may have oversimplified biblical repentance. But changing my mind about every situation I encounter every day is where repentance starts. Thinking is something I can do and it is not passive like waiting around for feelings. Thinking differently is the overlooked more important piece of biblical repentance. Man am I desperate for blog material or what? I played baseball and hockey when I was a yout. Both sports called for protection of the male anatomy. Unfortunately I did not learn the supreme value of an athletic cup protector until that one day I played in the catcher position during practice. As I squatted down to receive the first pitch I realized I forgot to wear my cup. I was age 10 or so. After the batter missed with a strike I felt the intense pain of getting nailed in the nads with a 60 mph pitch from a pitching machine. I still gag at the memory. On many occasions as well during my illustrious hockey career (I was so good I could have made it to state) I took slap shots, wrist shots, elbows, stick pokes straight to the sensitive area. It was part of the game. I knew also how to equally deliver the tactical blows to my opponents. It was part of my game plan. But ya'know? The protective cups never really stopped the blows from really hurting. There was still a lot of pain from the pressure of the blows and a lot of bruising where the cup rest against the groin area. The guy actually does flinch though.